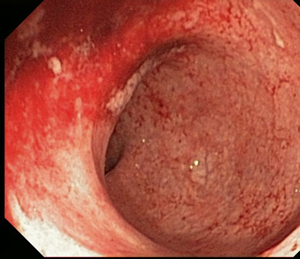 This image from a colonoscopy shows a section of the bowel affected with severe ulcerative colitis. The study, published in the August issue of Clinical Gastroenterology and Hepatology, is the first to look at patients whose colitis was treated with modern medications, from the relatively mild, maintenance drugs known as 5-aminosalicylates (5-ASAs) to immunosuppressive therapies such as steroids and the drug infliximab, which targets specific proteins in the body’s immune system to help control inflammation. Nearly 1 million U.S. adults have ulcerative colitis. The related Crohn’s disease can affect any part of the gastrointestinal tract, but ulcerative colitis patients have inflammation only in the lining of the large intestine or colon. The condition often causes diarrhea, bloody stool, weight loss and fever. In severe cases, some patients need surgery to remove the colon. The study involved 295 people treated at the inflammatory bowel disease clinics at the School of Medicine over a seven-year period from 2001-08. After treatment, 64 percent of patients diagnosed after the age of 50 were in remission, compared to 49 percent of those who developed colitis at younger ages. Patients in remission no longer have clinical symptoms of colitis, but many may still have inflammation and may need to continue treatment with 5-ASA drugs, but are able to discontinue steroids. Ciorba says those diagnosed early in life were more likely to have family members with inflammatory bowel disease and that genetic influences may play a larger role in their disease. More than one in five study patients under age 30 had a family history of inflammatory bowel disease. The researchers suspect that later-onset disease is related to changes in the aging immune system and to environmental influences such as smoking. Nearly 52 percent in the late-onset group were former smokers, compared with only 13.5 percent of the younger patients. Smoking is a well-known risk factor for colitis. Both younger and older patients received the same treatments, mainly 5-ASAs and steroids. About 63 percent of early onset patients and 68 percent of late-onset patients received either oral or intravenous steroids within the first year of treatment. Ciorba’s team says more research is needed into the environmental and genetic factors that differentiate late- versus early onset disease. That work could help determine whether older or younger patients may respond better to different therapeutic combinations or newer investigative therapies. The study was funded by grants from the National Institutes of Health and by a career development award given to Matthew Ciorba from the Crohn’s and Colitis Foundation of America.